There is a real Unicorn Hunters Society in the United States, in case you hadn’t heard. It was formed in 1971, even though, as you know, unicorns have been around forever. The society is based at Lake Superior State University (hereafter known as LSSU) in Sault Ste. Marie, Michigan (pronounced “soo saint Marie, hereafter known as The Soo). The Soo is at the northern terminus of I-75, just beyond the 46th parallel, an hour north of where I live most of the year. Up in the north woods hunting is a traditional activity, but until unicorn hunting was established only certain of us believed they existed. The Unicorn Hunters Society, knowing what chaos would ensue once word got out about the mythical creatures’ activities, wisely set up a list of regulations. Only one Unicorn per month. A success ratio higher than this often results in a form of euphoria, which of course requires a mental truss. This is highly undesirable. Female unicorns may not be taken. Since no one has ever sighted a female unicorn it is believed that males reproduce asexually. TERM OF SEASON. All days of the year except St. Agnes’ Eve. This exception is to protect hares who limp trembling through frozen grass from being trampled by running unicorns. Bow and arrow season is Oct. 1 – Nov. 14, then Dec. 1 – Jan. 1. 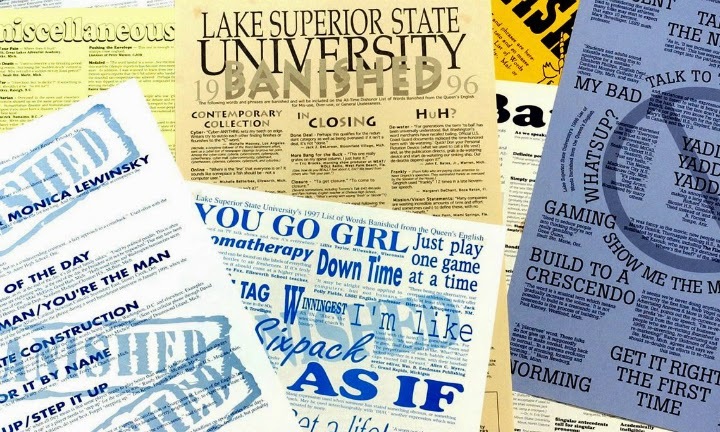 The society was founded by W.T (Bill) Rabe, a Public Relations mischief-maker from Detroit who later became the resourceful PR Director at LSSU. He was looking for something unique that would put the obscure little university on the map, and, for reasons obscure, he came up with The Quest for Unicorns. Bill Rabe, old PR expert that he was, chose New Year’s Day, 1976, for the list’s debut date. He knew from experience that January 1 is traditionally a slow news day, and the media, always hungry for tidbits on that day, would snap up the whimsical back story about the unicorn hunters and help to promote the Banished Words List. Some of the words from that first list: At this point in time, detente, macho, scenario. (See 1976 list here. See archive of all the words here.) Now the voting is open to everyone and the words or phrases that show up most often will get to the top of the list. Last year’s list included Selfie (no surprise), twerk/twerking, hashtag, Twittersphere (or Twitterverse, as someone corrected.) and Obamacare. This year they added BAE (a new word for me until my niece explained it), polar vortex, skill set, cra-cra, and my own favorite candidate, enhanced interrogation. I literally (Literally! Ha! Not on the list!) love lazy phrases and cliches, but only when I’m using them. I hate it when other people take the easy way out and use them, too. Amateurs! I’ve followed the Unicorn Hunters for years and I love these lists, but at the end of the day (1999), they’re just words, right? So far it’s not a crime to use them, right? So will I try to mend my ways?